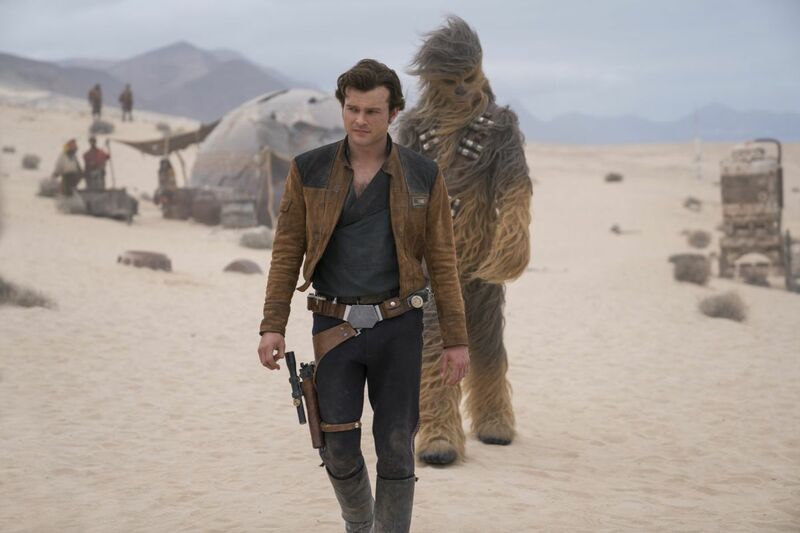 Alden Ehrenreich and Joonas Suotamo in "Solo: A Star Wars Story." The thing that Solo: A Star Wars Story director Ron Howard remembers, and that most people forget, is that Star Wars sprang from the era of the hot rod. In the '70s, movies like Smokey and the Bandit ruled the box office, and people drove in their muscle cars, in droves, to drive-in theaters to watch them. Howard was making hot rod movies (Grand Theft Auto) for Roger Corman; George Lucas (American Graffiti) was making them too, starring Ron Howard. The breakout star of that movie, though, wasn't Howard, but Harrison Ford, playing a motorhead convinced he had the fastest machine around. I don't remember Ford's character's name in that movie, but it may as well have been Han Solo. Certainly Lucas had the archetype in mind when he created Han, an outer space hot-rodder whose Millennium Falcon is the fastest getaway vehicle in the galaxy — making outlaw Han the uncatchable Bandit to an interstellar Smokey in an Imperial Cruiser. It would be too much to say that Star Wars was really Car Wars, but it had the energy of a road-race movie, that sense of mischief and fun, a tone that would eventually dissolve as the franchise got bigger, glossier, more grandiose. By the second trilogy, the vibe was gone completely, and greatly missed. Years ago, I spoke to Howard — who replaced Phil Lord and Chris Miller at the helm of Solo partway through production in a high-profile switch-up — about how much he loved the original Star Wars, in part for the way Lucas made the technology within the world he'd built so palpable, the way he made Luke Skywalker's Landspeeder look like a vehicle that had been driven, with corrosion and exhaust damage on the rim of the afterburners. You see virtually that same machine in the opening moments of Solo, Howard's reboot/prequel-Han Solo origin story. You not only see the vehicle, you see Han Solo (now played by Alden Ehrenreich), hot-wiring it (grand theft Landspeeder), as he makes off with valuable contraband that he and his girlfriend, Qi'ra (Game of Thrones' Emilia Clarke), intend to use to buy their way off a dismal, oppressive planet. There's a chase scene, Han does some fancy driving, and Howard swings around to show us those after-burners again, looking like the taillights of a vehicle from another era, another corner of the universe. A long time ago, in a Galaxie 500 far, far away. With all of that in mind, with Howard conveying so much affinity and affection for the original movie, I wish I could report that the opening scene is great, high-energy fun. It's not. In fact, it's the weakest section of the movie, which has to work hard to gain momentum, though it finally does, mixing new characters and ideas with old friends and references that harken back to the first trilogy. In Solo, Han falls in with bandits led by Beckett (Woody Harrelson, having a good time), who makes a dangerous living stealing things for black-market profiteers. The story (cowritten by longtime Star Wars scribe Lawrence Kasdan and his son Jonathan) doffs its cap to the first trilogy in a way that fans will enjoy (A better name for this prequel would be Solo: The Kessel Run). Along the way, Solo meets Chewbacca (former Penn State basketball player Joonas Suotamo), and the groundwork is laid for Solo's complicated relationship with Qi'ra, to be explored in future films, one that promises to explain the character of the older, more cynical Solo we meet in A New Hope. Solo eventually finds its feet, and the movie gets better as it goes, but we feel throughout the tension between conflicting visions of Howard and original directors Lord and Miller. This tension shows up in the performance of Ehrenreich, doing an inconsistent impersonation of Ford, and one that feels less successful and assured than the Billy Dee Williams homage we get from Donald Glover here as Lando Calrissian. You sense that Ehrenreich has been stranded between what one presumes was a more playful Lord/Miller vision, and Howard's more straight-faced approach. The result is uncomfortable, but not amusingly and intentionally uncomfortable (like Ehrenreich's clever work in the Coen Brothers' Hail, Caesar, playing a cowboy star miscast in a "sophisticated" drawing room comedy). Still, the movie generates a decent amount of goodwill, and after a couple of hours under the hood, Howard gets it running. And for all of its flaws, Solo has a buoyancy missing from slicker more Disney reboots, which are as remorseless as they are polished — retrieving characters from the beloved original trilogy, then dispatching them. Solo is dedicated to bringing them back to life. Directed by Ron Howard. With Alden Ehrenreich, Emilia Clarke, Donald Glover, Joonas Suotamo, Woody Harrelson, and Thandie Newton. Distributed by Walt Disney Co.
Running time: 2 hours, 23 mins.